Honeywell Safes Awarded Consumer Digest Magazine's "Best Buy" Award! The Honeywell Store's priority of releasing Honeywell products and accessories that continue to exceed industry standards have been a recipe destined for success. This fact can readily be observed with the announcement of three inductees in Consumers Digest Magazine's highly decorated series of "Best Buy" recipients. Selected by a collection of editors and celebrated for "representing exceptional value in today's highly competitive market", a trio of Honeywell Safes is being praised as a premier solution to safeguarding your valuables. The following safes were judged primarily on their ability to perform and the sheer amount of features made available upon purchase. Rigorously tested by professionals, critics and consumers alike, the Honeywell 1102 Molded Fire/Water Chest is fully capable of withstanding fire damage measuring up to 1550F for thirty minutes. Additionally, a series of waterproof components have been included to bolster all around defense. The .15 cubic feet of storage make this safe an ideal fit for those looking to protect personal documents, digital media and various other valuables of measuring length. 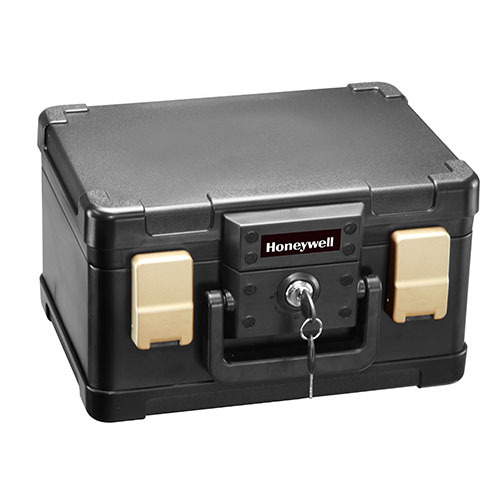 The Honeywell 1104 Molded Fire/Water Chest is another excellent selection for those searching for a safe that offers unparalleled protection without all of the bulky features usually attributed to a traditionally crafted safe. Secure the ultimate in peace of mind with this chest's ability to withstand 1550F of fire damage for an impressive one hour! Featuring all of the waterproof additions of the previous model, this safe is a first-rate selection for concealing paper documents of the A4 and Legal Sized variety when placed flat. The Honeywell 1106 Molded Fire/Water File Chest is the largest of the three award winning models and features all of the strengths mentioned in the previous two safes. The increase in storage capacity allows for any number of valid options to explore when choosing which contents to preserve. Regardless of whether you're looking to protect your legal letters, folders, digital media and various other personal effects, you'll have no shortage of space to satisfy your individual needs and requirements. As an added measure of safety, each of these models utilizes an antitheft key lock system. Consumers Digest Weekly has gone on the record to say that "on average, a Best Buy Rating is awarded to fewer than three percent of the competing models in any given product category." Given this statement, it's fairly safe to say that they search for the absolute best and reward products and accessories that go beyond the distance in surpassing a myriad of trials and expectations. When it comes to protecting and concealing all of those items you simply cannot afford to lose, the Honeywell Store has comprised a series of award winning Honeywell safes that not only highlight overall security, but feature excellent fire and water protection. Honeywell safes represent the elite and can go a very long way in securing you an unrivaled sense in peace of mind. See what all of the buzz is about firsthand and purchase a safe that's being celebrated as a "Consumer Digest Best Buy".